Leigh on Sea started life in Saxon times as a small fishing village. In those times the fishermen would have used wicker traps across the creeks to catch fish. By the mid-19th century Leigh fishermen used double-ended Peterboats, with a water filled well in the centre of the boat, to keep the fish and shellfish alive. Flat fish were also caught and stored in pits dug in to salt marsh, until sufficient had accumulated to make it worthwhile to journey into Billingsgate Market in London. But Leigh is most famous for its cockle boats. Cockle boats go out with the tide to the rich cockle sands of the Thames estuary. Until the late 1960's cockles were collected by hand raking, but today they are collected by hydraulic dredging. The boats return to port at the start of the floodtide, with the tide working in their favour. By day, the fishermen used to navigate using St Clements church tower. After dark they would use street lights on Cliff Parade (still there today). These light had red glass in the side facing the sea; by lining these up the fishermen could find a safe passage up the winding creek. Today, they have nautical GPS and sat navs. Leigh on Sea has a protected, sheltered location but was also of strategic importance from the 14th until the 18th century. With its strategic position it protected the Thames from the Dutch, French and Spanish navies and Leigh was an important embarkation site for troops bound for the continent. The mariners of Leigh were expert seamen, captains and admirals. Close to London yet within easy reach of the North Sea, the port offered a quick route to Calais during the middle ages, when English Kings ruled Calais. Leigh also had a significant boat building industry. In 1588 Philip of Spain was told by the Spanish Ambassador that 31 vessels had been built in Leigh which could be armed to fight against the Spanish Armada, and in due course a number of these ships were armed, and did assist in the historic battle. In the mid-17th century England was at war with Holland. In November 1652 the English lost the battle of Dungeness leaving the Dutch in control of the Channel. Admiral Robert Blake brought his damaged fleet to Leigh for repairs. This was completed with dispatch and by mid-February 1653 the fleet was again ready for action. The refurbished English fleet put to sea and the ensuing Battle of Portland cost the Dutch four warships captured, another five sunk and possibly two more burnt. Between thirty and fifty merchant ships were taken. Blake was seriously wounded, however, the battle had restored English naval supremacy and the Channel was now closed to all Dutch seaborne trade. 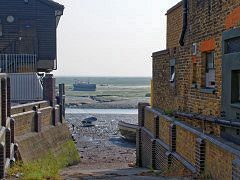 The estuary at Leigh on Sea was silting up by the 18th century and the significance of Leigh as a port declined steadily from then on. There are still a few working fishing boats going in and out, but this is just a fraction of the historic trade. However Leigh sailors did have another moment when their actions helped to turn the fate of the country: taking part in the flotilla of small ships which were sent to Dunkirk to help with the evacuation. One of these cockle boats, "The Renown", rescued around 1000 men. Cockle boats have a shallow draft making them ideal for pulling up near the shore so that the soldiers could get on board. However this meant first sailing across the channel, then navigating coastal waters bristling with mines whilst under constant fire from the German forces. The boat made repeated forays into the shallow water near the beach, pulling as many men as possible on board and ferrying then to a Naval destroyer farther out in the channel, then returning again and again to pick up more. The Renown got back to Dover safely but on the journey from there to Leigh, developed steering problems, so was being towed by a tug, along with another Leigh boat. Suddenly there was an almighty explosion. The tug had hit a mine which had a time delay: and the Renown was blown to smithereens. All on board sadly died. Today Leigh on Sea is a pleasant old fashioned seaside resort, with an attractive town centre full of weather-boarded houses, cafes, pubs and shops. There are a couple of boatyards, a beach and the famous row of historic cockle huts. For quiet contemplation of the estuary there is a nature reserve at Two Tree Island about a mile to the west of Old Leigh, and the more commercial delights of Southend are just a three mile walk to the east along the coast.